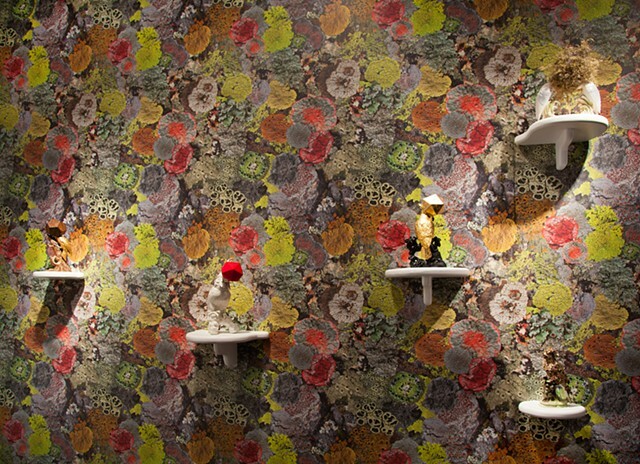 This wallpaper was created custom-digitally-printed for the exhibit. It shows images of true-to-life colored lichen as if they were growing over and covering the gallery walls in a natural camouflage pattern. This piece was created in collaboration with the lichenologists from Chicago's Field Museum, who generously gave access to their archives of beautiful lichen photos. These images were then digitally 'cut-out' and combined with my own lichen photos from the High Sierras to create this seamless, repeating pattern, used also (in a spectrum of greens) on the interior fabric of the Tell it to the Birds dome. Lichen is of particular interest to me for several reasons. Firstly, it is a known bio-indicator. To use an appropriate bird axiom, it is essentially a 'canary in the coalmine,' unable to grow well in polluted areas. Secondly, lichen is a symbiotic organism, and a cross-kingdom one at that; a communal organism consisting of both algae and/or cyanobacteria along with fungal cells, living together in a mutually beneficial way. I like the metaphoric possibilities of this collaborative organism and how it suggests that we humans may also benefit from expanding our field of collaborators to others in the natural world. A similar installation is in the permanent collection of the Joyce Foundation. The 'Natural Camouflage Lichen Wallpaper' is available for purchase, with a portion of the proceeds going back to conservation and research. It is eco-friendly, easy to install and remove, and custom-printed by a Chicago small business. If you're interested in learning more, please contact me.